You hear a call for distress and you instinctively know what you have to do. The bodysuit is right there in your closet, complete with the red and yellow superman crest on the chest and the soon-to-be free-flowing cape. Grabbing it with one hand, you press a button with the other. The button opens the rooftop access and away you go. To the rescue. Although sparsely distributed and occurring only on certain days in a year, there are those pivotal moments when we feel like we are super human. On such days, we seem to be surprisingly endowed with extra bursts of energy to do every single thing we wish to do in only so much as a day's work. We pray, do our devotionals, make breakfast platters fit for champions, bathe babies, feed them, eat fruits and veggies, exercise, pack lunch, go to work, attend conferences, hold meetings, lead teams, train employees, pick the kids from school, wash dishes, get dinner started, do laundry, wipe noses, read bed time stories, write blog posts, say our prayers once more, and finally go to bed (I purposely made that a really long sentence to emphasize the super-humanness of all that). Yes, real life super human stuff. Amazing, right? "Dear daughter, my grace is sufficient for you, for in your very weakness, My strength is perfected." 2 Corinthians 12:9. And when I get reminded of this I just let go and let God. Isn't it amazing to know that I don't have to struggle all by myself? No, when I'm weak He is strong. When I'm sick, by His stripes I am healed. When I make mistakes, because of Jesus I am redeemed. When I feel inadequate, He becomes my sufficiency. In lack, I still have everything. When I have a need, He is able to supply all my needs according to His unending riches. God is my amazing necessity because in Him I am complete. Hallelujah. Let me tell you something. 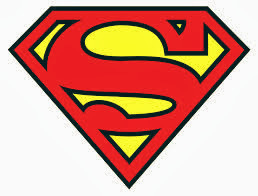 If you are reading this and you feel like the opposite of "super human," I want you to know that you're in the right place. Here on this Blog, I am celebrating my SUPER GOD. No, not my "super human." No human is as super as my super God. If you're tired of being strong all by yourself, you have the right to be. He is our daily sustenance. Without Him, we are lost. We need His grace just to be. I don't have to be super human when I have a super God. So please, let go of your ego, super humans. Yes, Jesus said we will do greater things than He did here on earth, but these things won't happen because somehow we have super abilities, they will happen because of the power of God in us. Everything we do, we do only by the grace of God. If we should glory in anything, let it be that we have a super God. It's never by our power or might, but by the Spirit of God. May God continue to use you to exert His glory in your field of influence, in Jesus' Name. Amen. Have a blessed week, Readers. I'd love to read from you in the comments as always. Have there been times in your life where you've questioned your strength and/or weakness? Rest in His grace today. Your story is not over until it is over. It's like a seed a farmer plants in good soil. With the advent of spring, it begins to bud. Once summer comes, it spreads its wings and blossoms. As fall approaches, leaves begin to fall, shedding unwanted fragments from past seasons. Shedding off the unnecessary. The irrelevant. And when winter comes, it dies or remains dormant...only to be resurrected again the next spring. And the cycle goes on and on. Like words in a book, smothered with commas and colored with cliff-hangers, so are the words that carefully detail your life's story. They keep speaking. They don't stop in the middle of a sentence. One look at that verse and an epiphany comes forth. I stop reading once I realize that in the previous chapter Lazarus was dead. Dead. Buried. No longer breathing. One day he was living life to the fullest, having fun days with his sisters, Mary and Martha, and his friend, Jesus. And another day he was dead. But in this chapter, praise God, he IS alive again. In this chapter, he's referred to as the "Lazarus who had been dead, but who Jesus had raised from the dead." The details of Lazarus' life's story were only just unfolding at this time. His death was only a comma. A pause. A glitch in time. An ellipsis. A stint. And then his resurrection happened after that to show the glory and power of God. You might be in a situation where you think it's the end of the world, but if only you could see through the eyes of God, you would give it one more push. You will be resurrected. We die daily, but we also resurrect daily in Christ. We constantly die to things that are of no use to us. Every week, a truck comes to my neighborhood to pick up all the week-long thrash, disposed items deposited daily into the dark emptiness of a trashcan. So also are the things we die daily to. The things of the world that we lose: our old character, our fleshly desires, our old goals, our no-longer-used physical items (an old couch, old clothes, old lip gloss, old toothbrush). I was a teenager once. Filled with young, ignorant desires. Sometimes excellently justified desires. Those were great times. The best of times and the worst of times. I remember spending long vacations with my siblings. Going swimming. Eating suya. Chicken and chips. VBS. Buying that bright pink Adidas tennis shoes that became my most priced possession because I bought them from a real Adidas store in Lagos (major thanks to my dad). I loved and was loved. I laughed and cried. I was full of life, and I still am. However, now I'm in my late twenties (really!). But hey, I'm loving where I am. I have a wonderful husband. An adorable baby. A career that's gradually pushing me forward past boundaries I could never have imagined I'd be pushing (no, I didn't plan to be in this field). Right now, I have no limits to the things I can do. I know God wants me here, but I also realize now that my life is only just unfolding. Like Lazarus, some things in my life might have died, but I stand here to praise His name because I have been fully resurrected in Christ and I'm swimming in newly found grace for this beautiful dream of a life God has placed in front of me. I am somewhere still at the beginning of the book God wrote about me. So much is still ahead of me. I'm still pressing forward. Of course, I still have loads of things I want to accomplish and challenges to overcome. We all have those. But the key is dying daily to things of the world that are irrelevant to my purpose, and resurrecting daily in Christ. Learning daily. Gleaning wisdom. Feeling empowered. Dear Readers, if there's something in your life that seemed really precious to you and it's dead today, don't stop living. 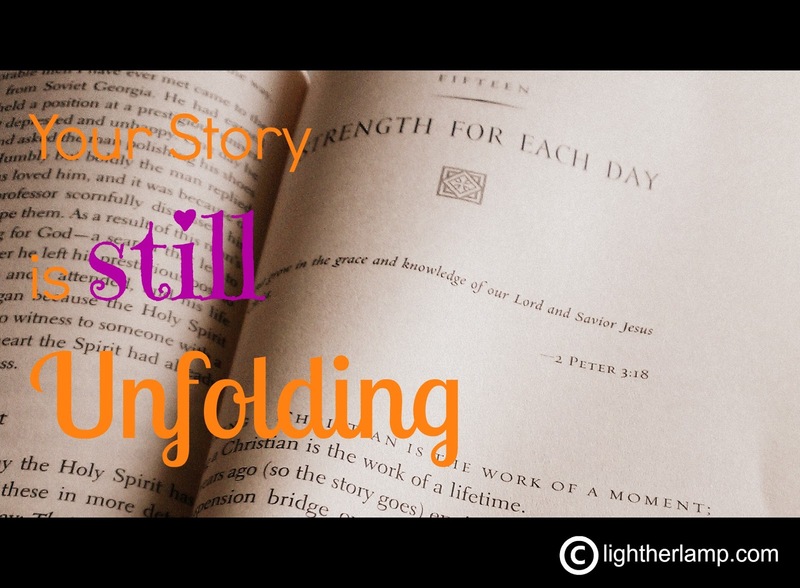 Your life is still unfolding. Ask the Holy Spirit for the next step to take. If there's one thing you get out of this, I want it to be these words: "My life is still unfolding. God is making everything beautiful in my life right now. There's so much to be grateful for right in this moment. I will anticipate my future because God is not done with me yet. I will die daily to the things that are irrelevant to my purpose, and I will also resurrect daily to face newness in Christ." Question: What is that one thing in your life that God is directing you to let go of, but you're still holding on to? I'd love to read your comment.